The main Silfra fissure is approximately 300m long with an additional 100m or so extending out into Thingvallavatn, but Silfra also consists of other connected fissures that run parallel to the main fissure and which over time have created a lagoon to the eastern side. The total area of water known as Silfra covers an area of just under 1km2. When coming from the car park the first area you see is commonly referred to as the ‘Toilet Bowl’ as it links to a tunnel that used to ‘flush’ divers through into the main part of the fissure. This practice is no longer allowed due to the instability of the tunnel, but the Bowl is still an important area linked to Silfra, as it also holds the entrance to the cave. The cave penetrates back under the road towards the car park to a known distance of 85m and also holds the deepest point of the Silfra fissure, at 63m. It is full of narrow passages and is strictly forbidden due to a risk of loose rocks and collapses. Although the cave was mapped by a group of American cave divers in 1998 it is unknown what changes have occurred due to recent earthquakes. 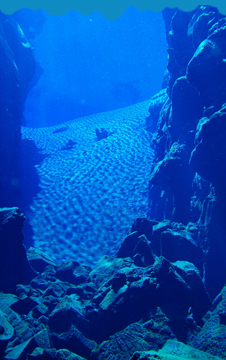 The first of the five sections of Silfra that divers and snorkelers have access to is known as Big Crack. This section is 120m long and holds the deepest area of the main fissure. The first part of the fissure drops to 23m before it heads down under the rocks to a maximum depth of 45m. This whole section is riddled with caverns and swim-throughs at various depths, although all of them are now prohibited due to the unsafe construction of these tunnels. Big Crack also holds the shallowest areas – it is only 0.5m deep beside each of the 3 islands in the crack – and is also the narrowest section; divers are literally able to touch both sides at once here! The second section is known as Silfra Hall. This is where the fissure firsts widens out and opens into an area 10m deep, 50m long and about 8m wide. The bottom here is littered with boulders half the size of cars! From here you move into The Cathedral, which is a truly awe-inspiring sight. At 100m in length, 20m in depth and with walls that run to within 30cm of the surface, it is easy to tell where the name came from. Upon entering the Cathedral it is possible to see all the way to the end, proving the visibility of over 100m, the longest recorded visibility anywhere in the world. At the end of Cathedral is one of the most dangerous spots for divers and snorkellers as the up-welling of the current to a depth of 2-3m tries to push them out into the lake, so it is important to make a timely left hand turn and enter into the penultimate section of Silfra. Silfra Lagoon offers more dramatic views with visibility stretching to 120m. With a shallow sandy bottom, the water in the Lagoon takes on a more turquoise colour which is a beautiful change from the deep blue or the fissure. Snorkelers and divers swim the length of the Lagoon to get to the exit platform, although those wanting to explore further, can also head off to the left hand side to discover the final section of Silfra, Little Crack. Little Crack is almost like a miniature version of the main fissure, with both deep and shallow sections and many tunnels. It is only possible to see the Southern half of Little Crack as it gets too narrow to pass through at the Northern end.